You’re some of the most awesome friends we’ve ever known! Bowl for Kids Sake is such an important community fundraiser for Big Brothers Big Sisters of Prince Edward Island. 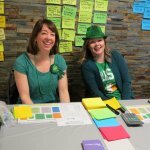 We can’t thank everyone enough for helping raise a pot of gold to help provide mentors for some really great kids! 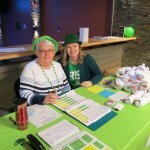 On March 2nd & 3rd, we had had so much fun celebrating the success of 230 teams at St Patrick’s Day themed Thank You events in Charlottetown, North Rustico, Summerside, Souris, and Tignish. 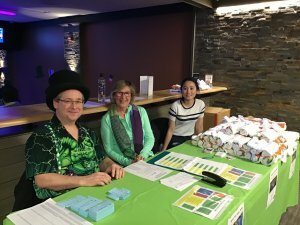 Bowl for Kids Sake 2019 was a huge success! We would like to thank all of the participants, sponsors and volunteers who helped raise more than $122,375!! Imagine who they will become because of you! Thanks to the Air Canada Foundation, we were able to award one of our fundraisers with a really great prize! Everyone who raised $150 or more had the chance to win 2 tickets to anywhere Air Canada flies in North America! (including Mexico, Hawaii, and the Caribbean). The more people raised, the more ballots they received…..and our ballot box was full! On Wednesday, March 28th, Brianna Flood, team captain of the Spring Valley Building Centre Lucky Strikes team, won the tickets. Congratulations Brianna! You can’t have a great party without refreshments! 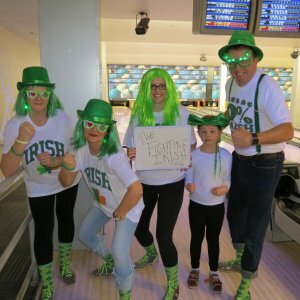 Bowl for Kids Sake Weekend is our chance to say thank you to more than 1100 people in 5 different locations across PEI. That’s a lot of logistics for our food sponsors. 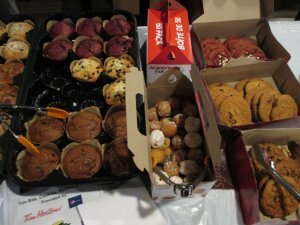 We want to thank Tim Hortons, our brand new Food Sponsors, for jumping in with such enthusiasm. 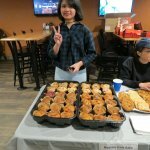 The Kensington, O’Leary, St Peters Road, Water Street Summerside, and Winsloe locations provided yummy muffins, cookies and Tim Bits throughout the weekend. We also want to thank our friends at PepsiCo Beverages, who were back with a variety of soft drinks for our bowlers. We really can’t thank Tim Hortons and PepsiCo Beverages enough for their support! have a transformative effect on their lives. When a child has a mentor, the odds they will be emotionally, socially and physically healthy increase dramatically and when we have healthy young people in our communities, everyone benefits. mentor, young people can gain the confidence to achieve more, leading to brighter futures. With your help, last year 482 children & 388 Teen Mentors were involved in programs across Prince Edward Island! Our Bowl for Kids Sake Matchmaker members are amazing! They have each raised $1200 or more, which is what It costs to make a brand new match. What an awesome achievement! Meet Wayne! He is the amazingly talented Guardian designer who creates all of our ads. This is the second year that he has designed our Bowl for Kids Sake t-shirt. 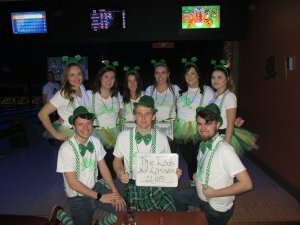 If you have a St Patrick’s theme, you absolutely need a cute bowling pin leprechaun! Last year, he created a Dracula bowling pin….can’t wait to see what he comes up with next year!! Wear your #BFKS2019 t-shirt with pride & tell the world you’re awesome because you support mentoring! Thank you to our amazing Bowling Alleys! Chucker’s Trophies & Awards Ltd.
Bowl for Kids Sake really is an enormous undertaking for a small staff. We would not have had such a successful event without the help! 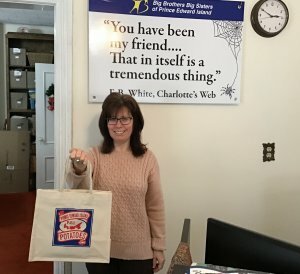 Our event volunteers help pack BFKS team bags, roll t-shirts, and stuff tax receipt envelopes in the office and help run the Charlottetown and Summerside events on BFKS weekend. 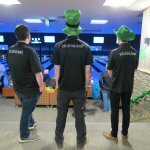 With the help of some great sponsors, we were able to provide a fun St Patrick’s Day themed bag with everything our teams needed to get started. 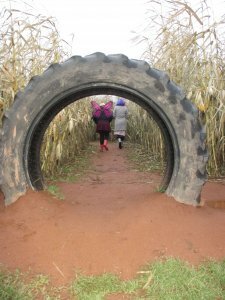 The PEI Bag Company provided fun potato bags which helped everyone get into the spirit from day one! 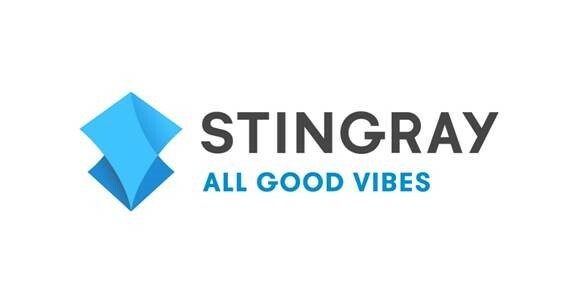 Telling the world how awesome the businesses and groups who support us is important – the bags made for some great social media photos! Treats are also an important part of the team bag. 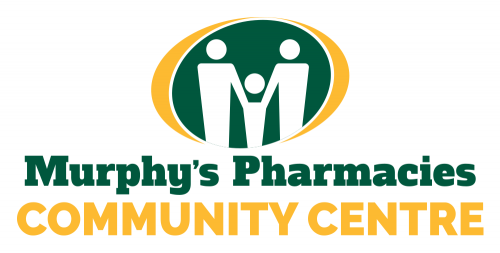 This year’s bag had Rainbow Seed bags with candy sponsored by Ganong, green pens from Grand & Toy or TD Canada Trust, and flavoured sparkling water from Murphy’s Pharmacies. Each year, we hire a Bowl for Kids Sake assistant to help with our campaign. Andrea started with us in early January. 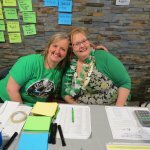 She recruited and took care of most of the North Rustico, Souris, Summerside & Tignish Bowl for Kids Sake teams and helped Mary with Charlottetown teams too. 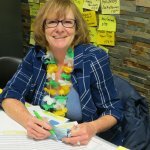 If you were in Charlottetown, North Rustico or Souris on Bowl for Kids Sake weekend, you might have had a chance to meet her. Andrea will be with working with us until the end of May. She is currently busy doing paperwork and data entry, but she will be working with the public again when the Dream Cottage opens. We would like to thank Skills PEI for providing support for her position. Best Team Name: Harbourview Training Center St Patty’s Day Strikers won a $25 Gift Card sponsored by Ching Brothers Inc.
Best Team Costume: Kathleen MacNearney’s Roving Irish won $25 Gift Card sponsored by Ching Brothers Inc.
We are grateful for the support of our Bowl for Kids Sake Sponsors – and a campaign this large would not be possible without them!